Is Traditional Acupuncture (TCM) Right for You? TCM is a comprehensive medical system that helps to restore and maintain your body’s equilibrium. Treatments aim to tackle the root cause of your condition as well as your main symptoms. Typically, a course of treatment is recommended at the start, with most then moving on to ‘maintenance’ which may consist of a top up treatment every 4 to 6 weeks (course discounts are available). 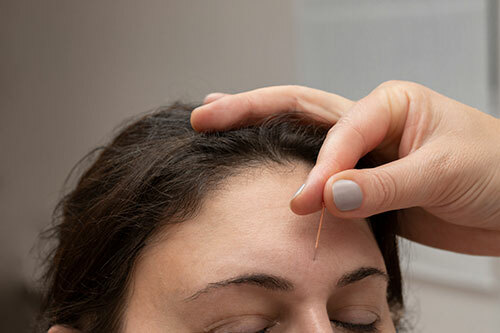 Many that try acupuncture often report that as well as helping to resolve health problems, it can also enhance your overall feeling of wellbeing. The treatment is often combined with lifestyle and diet advice. Most people find acupuncture relaxing and often feel very calm after a treatment. You may feel a little tired or sleepy and should take this into account after your treatment. It is suitable for all ages and can be used effectively alongside conventional medicine. Acupuncture has very few side effects and any that do occur are usually mild and self-correcting. Acupuncture has been shown to raise the levels of certain hormones, prostaglandins, white blood cells, gamma globulins and antibodies. It is known to stimulate endorphins – the painkiller and ‘feel-good’ chemicals we naturally produce. These are often referred to as naturally produced ‘opiates’ and some are thought to be 200 times stronger than morphine. Other theories that involve the Central Nervous System and the Cardiovascular System also exist to explain the workings of acupuncture. The explanation from the Eastern perspective is based around the flow of qi (‘vital energy’) around the body and brings in to play the theory of “channels” or “meridians” as well as disharmonies in the Chinese Organ system. It is essentially a form of observational medicine developed over centuries that can now provide us with a great deal of insight into our own health and how to resist “dis-ease”. No need. The needles used are very fine, single-use, pre-sterilised needles to stimulate specific acupuncture points on your body. Other techniques may be incorporated into your treatment such as cupping, acupressure or the use of a TDP (mineral plate) heat lamp. Helen is highly experienced in working with patients that have a pre-existing fear of needles. Helen is also available for a free 15-minute phone consultation to discuss if acupuncture is right for you prior to booking. Helen treats a wide range of health conditions and has undertaken specialist training infertility support and is experienced in treating women throughout pregnancy and beyond. Hayfever, colds, sinusitis, asthma, low energy. Backache, muscle and joint pain, arthritis, injury recovery. PMT, painful, absent or irregular periods, PCOS, endometriosis, menopausal symptoms. Providing IVF support and help to conceive naturally (male and female). Morning sickness, hip pain, sciatica, pre-birth, spd, blocked ducts, birth recovery. A course of 4 acupuncture treatments.